I live on Kangaroo Island, near Adelaide in South Australia. I've been an artist & illustrator specialising in wildlife subjects for twenty years. I have produced a lot of illustrations during this time for books, magazines and interpretive things like signs and leaflets. Recently, most of the work I have been doing has been for organisations like National Parks & Wildlife, who have been keeping me busy doing display work, leaflets, etc. 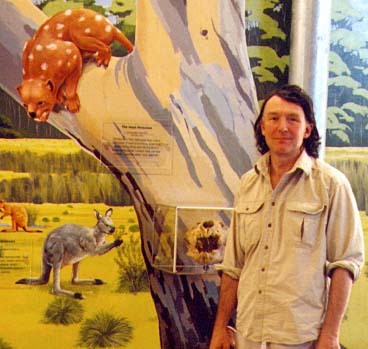 I've just completed a major job for the exciting new Flinders Chase Visitor Centre on Kangaroo Island. I also did a lot of the illustration work at the Alice Springs Desert Park. Mural painting has been a recent new departure for me. I'm a very versatile illustrator, and enjoy working in different areas. I love doing cartoons and do a lot on the computer these days, using programs like Painter and Illustrator. I put this website together for myself. Between illustration jobs, I can get back to my easel and do my own pictures. These tend to be of wildlife subjects, but I'm starting to develop an interest in landscape painting and hope to do more of it in the future. The Kangaroo Island landscapes are lovely. I do most of my painting in acrylic these days.